The Competition and Markets Authority (CMA) has published a discussion paper for consultation covering the benefit or otherwise of granting a wider range of track access rights to open access operators. Responses are required by 16 October 2015. In setting objectives for the UK rail passenger market, the CMA wants to see a structure that produces efficiencies that reduce operating costs, brings downward pressure on fares, and enhances service quality and innovation without placing additional demand on the taxpayer. It has also identified the need to improve upstream efficiency, and judges that new track access applications generate innovation in the way the network is used which is compared with improved airport management as a result of greater airline demand. Competition is currently for the market – based on franchise bids which have been successful in providing a structure to increase capacity to cater for 1,600 million annual journeys which is double the figure at the time of privatisation but the CMA believes that the process means that for the duration of the contract competition is muted. As a result efficiency has not matched the performance of the UK rail freight sector where there are few barriers to market entry or the results from EU airline deregulation and the benefit of low cost airlines. In a reference to air markets, the discussion paper identifies that competition by rail operators between Milan and Rome has raised rail’s market share in the manner that has been predicted if open access services were allowed to target the airline market between Edinburgh and London. 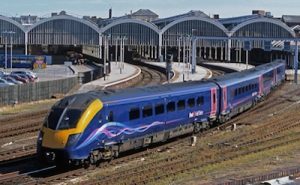 A consequence for passengers of franchise route monopolies is also discussed with a comparison of peak-time advance fares between London and York and over the same distance from London to Manchester. On the East Coast where there is competition the franchised operator offers a fare of £49.50 whereas on the monopoly West Coast route the price is £105. The CMA also points out that this competition did not affect the ability of the East Coast franchise to pay significant premiums and more recently the sale of the UK Eurostar holding achieved a higher price than expected despite the likelihood of future competition. The discussion paper lists options for reform that include open access operators paying higher track access charges for new services to compensate for any loss of franchise revenue and a projected universal service levy to fund loss making socially necessary services. There is also the idea that on main line routes two franchises are created. One described as the Anchor contract would include any services that required cross-subsidisation and the other a fully commercial operation. Contributors to the consultation are asked to address three key questions. Would open access operators accept higher track access charges in return for new service opportunities, is the concept of a levy towards the cost of unprofitable services a way of making up any shortfall in Government revenue from franchise premiums and finally what impact will signalling modernisation have in increasing capacity to reduce current market entry barriers due to capacity constraints?